Family Movie Night: We saw ET. Movie reviewed by my kids. On Saturday night, the five of us squished onto the couches in our family room and we had our first ever family movie night and we saw a movie from 1982 which I had never seen before. We watches ET. We watched the updated version from 2002, and I really liked it, as did the kids. Linus was scared during parts of the movie – no surprise there – and Boo had her moments as well, but Stewie sat there the entire movie, locked-in to the action and I could tell he thoroughly enjoyed it from start to finish. “Gamay, we watched a movie on Saturday. 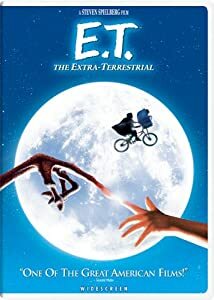 It was called ET and it was about an alien. In the movie, the aliens were sent to earth to collect flowers and plants. An alien called ET was left there by accident. He found a boy who became his friend and took him home by leaving a trail of Reece’s Pieces which Mommy said were supposed to be M&M’s but the M&M people didn’t want ET eating their candy. When the boy was at school his sister was teaching ET to talk because they were friends of the family. She taught him to say ET phone home because he wanted to go home but he didn’t know how to say it. Then the police caught ET and he was sick and almost died. But the boy came and said he loved him and ET’s heart started beating again. Then they took ET and went to take him to his spaceship. So they were driving, polices were trying to catch them and they were so close to so many polices and police cars and the alien had magic powers and he made them fly. Now I can wipe that movie off my bucket list… Movie nght with the kids rocked! Previous Post Guest Blogger: Stewie writes! Next Post US Presidential Election: What you need to before you vote, Canadian style. Would you believe I’ve NEVER seen it?! That was me one week ago. Now I’ve seen it and I wasn’t disappointed. I haven’t watched this with the kids yet, I remember how much cried and how scared I was. So I was waiting but maybe they are ready for it now. I love that movie! Oddly, my 7yo son and 2yo daughter were scared – him more than her, but my 6yo boy didn’t flinch. He wasn’t scared and loved it.